A coordinator with the Center will match you with the worker that best meets your needs. Please provide me with information as to rates and your program. I have a very small house cleaning business but often do not have the house cleaners to take on larger jobs. Please e-mail info on the proceedure I would follow in order to get house cleaners through you. Thank you. The rates for the this type of labor starts at $15 per hour. The rates do depend on the intensity of the labor, the amount of hours, and the tools/equipment supplied. Please feel free to call the center at (909) 397-4215 or email us at peoc.staff@pomonadaylabor.org so that we can have a conversation about how we can work together. Someone then could connect you with the workers who best match your needs. We’re looking forward to providing this service to you via our workers! We hold meetings at the PEOC site every Tuesday morning at 8:30 AM. my sister is unemployed and needs to work as soon as possible. how can she apply for that job? We hold meetings at the PEOC site every Tuesday morning at 8:30 AM. We can add her to the jobs list. Tenemos junta de trabajadoras cada martes a las 8:30 AM aqui en el Centro Jornalero. I need my windows,blinds,walls and some deep kitchen & bathroom cleaning but would like to get done before my husband comes back from being out of town I would also like this done every 3 months can you give me a quote for 3 people to get done in one day? we’d like to be able to help you and provide these services for you. Please feel free to call us at 909 397 4215 between 7 AM and 3 PM Monday thru Saturday to help. I am a faculty person at Pitzer college. I have been teaching for the last 20 years. I know Jose Calderon, he is a friend and he used to be my colleague. I need a house cleaner, please contact me ASAP. I will need this service every other week. I have a 4 bedroom home in Upland. I prefer the person to come on Friday or Monday. Please come and check the place and give me a rate. I also need someone to stay with an elderly person some evenings from 5-10 pm. She is 104 with some mobility, she is not ill, just a little frail now. She just needs to know that someone is in the house, and in case of an emergency to contact me. She sleeps most of the time now. I have two pugs and the person must like dogs. Thank you for reaching out to us. We’d love to be able to help you and provide these services for house cleaning and home care. 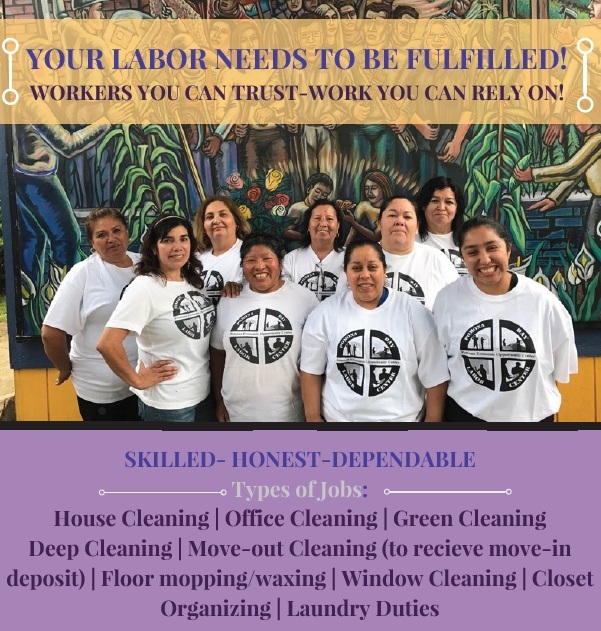 If you haven’t done so already, please feel free to call us at (909) 397 4215 between 7 AM and 2 PM Monday through Saturday to speak Javier with our labor coordinator.